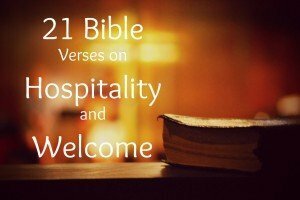 Do you need Bible verses to consider for your hospitality committee devotions? Perhaps you need a list of welcoming bible verses for your greeter ministry? Romans 13:8 Owe no one anything, except to love one another; for the one who loves another has fulfilled the law. 3 John 1:5 Beloved, you do faithfully whatever you do for the friends, even though they are strangers to you; they have testified to your love before the church. You do well to send them on in a manner worthy of God; for they began their journey for the sake of Christ, accepting no support from non-believers. Therefore we ought to support such people, so that they may become co-workers with the truth. Download this file for free for quick reference and take it to church. 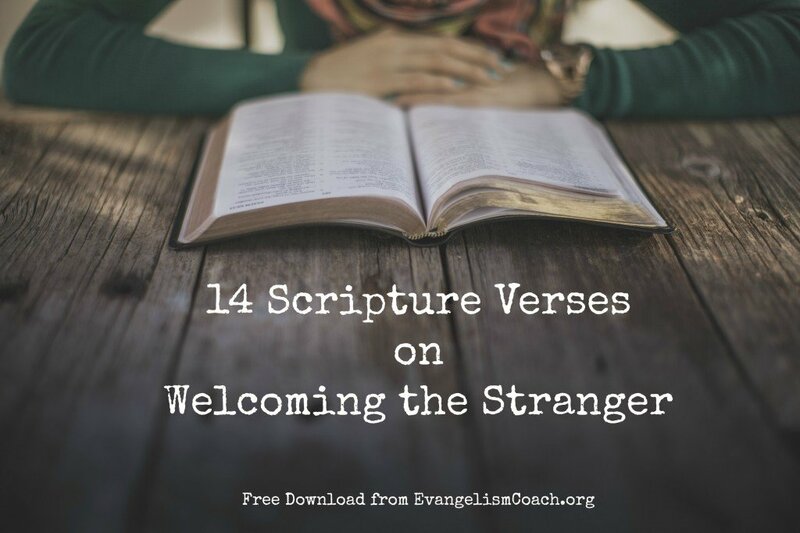 You can turn this list of bible verses on welcoming the stranger into a simple email to your greeter volunteers as a reminder of how they are called to extend an awesome welcome to your visitors and regular attenders. You might even consider separating them out one at a time for your reminder emails. No matter how you use them for your hospitality ministry, allow the Scriptures to shape the attitude of your greeter volunteers and others who participate in your welcome ministries. Webinar: Are your Church Visitors Coming Back? Hello all, I am looking for ideas from you as to what format or different welcomes that you use/say to your visitors. I’m talking the formal welcome that you may give before the entire church congregation. We’ve done many things, such as, start with a scripture and then thank them for choosing to worship with us. But it would be interesting to see what other churches are doing in regard to a formal welcome/greeting to the members and visitors. There are some members of our Hospitality Ministry who struggle with doing the formal welcome because they feel they don’t know what to say. It also is a struggle for some to just stand before the crowd. This is such important information Chris, thank you for your ministry. I just sent a copy to the pastor of the church we just quit going to. Maybe he’ll read it. As another note I think some pastors are focused on their retirement package and won’t deviate from the authorized denominational script for the week for fear of upsetting the denominational hierarchy. We don’t have a church to go to now because they all seem to be following the script and are not dealing with the reality of today’s world. I feel like the Lord is going to shake up the Christians in America like he is in Iraq and elsewhere in the world. The days of American dominance in the world and missionary leadership is drawing to a close. Home groups are the backbone of the growing church and persecution fuels the growth. Thank you for the ministry the Lord has called you to. Great verses. I’ll definitely write some of them down and I’ll try to remember them. I know that some day they will help me. If you need some encouraging bible verses, read that article http://hardquotes.com/moving-quotes/encouraging-bible-verses-believe . They inspired me so much. Thank you! Be blessed and share it with your friends via Facebook, Pinterst, or Twitter. I was ask at church to be a Emcee, I said ok but I have never been to a home coming before and not sure what I’m suppose to do as a Emcee at church. Please help me do not know what to say or do. Scared but willing to do it. I just want to encourage you bother. You will not find a perfect church. It is not your job to fix the church or pastors. God wants to use you to serve and use the gifts he has given to you in your local church to help encourage the believer and make disciples of all men. Don’t allow your frustrations to keep you out of the church. Instead of fault finding ask God to connect you relationally with the others he has surround you with in the church. If there is something morally or ethically wrong than leave the church and find one that you can support. Don’t sweet the small stuff. Stay focused on the bigger picture. The church isn’t there to do everything the way you think it should be done. The church is there to make disciples and encourage the believers so that they can do God’s work thought the week and impact the world they live in with the Hope of the Gospel. Bless you brother! Since there is so much on the internet about refugees coming to America I thought maybe this was directed to us to welcome them here because many of us do not agree with them coming. So I looked up verses for non believers. 2 John 1:9-11Whosoever transgresseth, and abideth not in the doctrine of Christ, hath not God.He that abideth in the doctrine of Christ, hath not God. 10 If there come any unto you,and bring not this doctrine, receive him not into your house, neither bid him God Speed. If this is not the point I agree For all others I agree. These verses are not directly aimed at welcoming refugees to any country, but the principles can be the same. We are called to love and serve. THe first two OT Versus above might be very appropriate to the discussion for refugees. How to balance that with issues of national security is a modern debate that needs to be considered in how to live out the tension between open welcome and security. I used this as research for a paper I wrote proving to my fellow Christians that we cannot possibly behave like Christ if we deport illegal immigrants, and that we cannot possibly behave like Christ if we are going to deny refugees. Great material and to find these verses all in one place… thank you! I urge pastors to do sermons on this topic! @Nathan It’s quite a tension to both a). Welcome the Refugee and b). Protect national security. That would be true for any nation state and its leaders. These verses are good to add to the discussion as one formulates how they will act to do justice and love mercy while walking humbly before God. You are most certainly welcome. Thanks for passing by. Welcoming immigrants or not is a government policy which is formulated on needs and security of the host country.I can understand a christian voting to place a representative in authority for or against immigration, both with legitimate reasoning.No criticism can be levelled here. Once the immigrant enters he is to be treated and welcomed as a fellow citizen. It is assumed the immigrant would follow the rules of that country. What has changed is many immigrants, fleeing his home country because of warfare, violence, religious intolerance works to implement the same condition that brought about the problems in his home country. Unfortunately authorities that voted to bring in immigrants discard their responsibility to follow up on the behaviour of the immigrants. You are correct on the one hand that welcoming immigrants is a government policy. National security and accepting immigrants are truly beyond the scope of this article, though verses might be used in forming ideas. On the other hand, if the immigrant is one’s neighbor, one has the responsibility to be the good Samaritan. One has the responsibility to be loving, welcoming, caring, and gracious, and making sure that unjust treatment is stamped out. As to the thrust of these articles, they are really aimed at starting a discussion on how to welcome the person not like you at church. I will not permit rabbit trails into debates on immigration policies on various countries. I removed your comment on Canada to avoid said rabbit trails because simple online searches on canadaian law brings up different results and this is not the place to get into nation specific immigration policies.